Yesterday my fiance and I had to go do some shopping for his work, so we decided to stop by Romer’s. I have been here a few time and they have never disappointed. We decided on some “criteria” for each review. So here you go! Always a good go to place when you want a burger. They have any type of meat you feel like that day, they even have a veggie burger for my Bro and SIL. I have never been disappointed with anything that I have ordered, if anything I have been blown away. Its a classy spin on a burger joint with the exterior and interior looking very high quality just like their food. Highly Recommend. I have to get it off my chest, I know its not Romer’s fault, they can not control it, but since they are located on one of the BUSIEST streets (especially yesterday for some reason) it is impossible to park. They have parking right beside them but its always an adventure. THAT being said, the first impression has always been for me very welcoming, warm, relax, chill place. We walk in and the whole place smells delicious. Our host greeted us at the door and everyone was wearing mustaches (fake of course) for Movember. Our waitress was bubbly. She had her fake mustache on and was really friendly. She told us the special right away, knew everything on it, and really knew the whole menu. Very energetic person that just makes you smile or laugh because of her silly mustache (I cant even take someone with a real mustache seriously!) We ordered pretty quick, never had a empty drink, and the food came out pretty quick as well. We started with BBQ Short Rib Sliders. Three little burgers, the waitress was joking asking how will we separate them, we shared evenly… they were really good! I ordered the special, Lamb burger, make mine green. Romer’s has this amazing bun, its a Brioche bun and its light and fluffy and amazing, BUT I have wedding next year, so instead you can opt to have it on a little head of iceberg lettuce (this is also good for the gluten free’s out there). Anyways, it had Gorgonzola cheese, with, I think, the onions were braised in red wine. The lamb itself was juicy and really need I say more, it was gone so fast! I finished mine before my fiance got half way!! Fi had the Chorizodor, (house-made chorizo spicy patty, topped with cheddar, pepper jack and creamy boursin, fresh avocado slices and Diablo sauce) and then he added some bacon. He also made his green, and really tried to prove me wrong when I said he should eat it with a fork and knife. He insisted on trying to pick it up with the lettuce on both sides, and it was a little funny to see the mess. Its completely up to you guys, but from my experience, if you don’t want a mess pick up the utensils, if you can prove me wrong, take a picture and send it to me :). He loved it anyways no matter how messy it got. We also got a side of yam fries, (just one is big enough to share) and chipolte mayo and banana ketchup? I have to say I was weirded out by the the ketchup, not my cup of tea, but Fi liked it. I am in LOVE with their chipotle mayo, love love love. Fancied everything we ate….although I am still not sold on the banana ketchup though..try it see if its for you! Have you been? How did you like it? 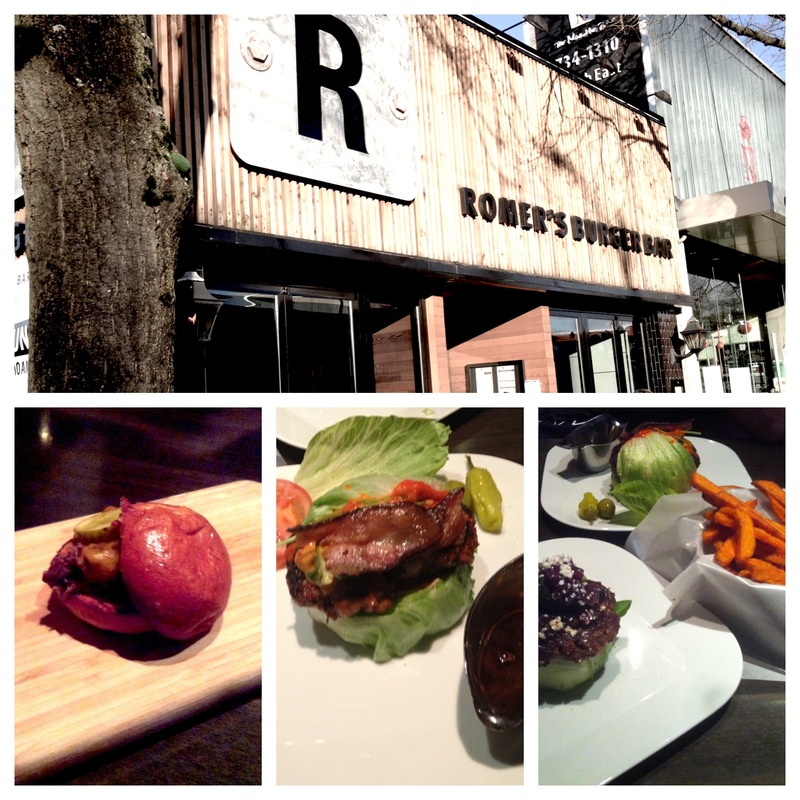 Tags: buger joint, fake mustache, food blog, food critic, food review, gluten free, heritage farms, restaurants, romer's burger bar, romers, vancouver. Bookmark the permalink.